This paper examines the issue of horizontal inequalities in Vietnam over the past 20 years. Using data from three recent Vietnam population censuses (1989, 1999, and 2009) and three Vietnam Household Living Standard Surveys (1998, 2008, 2012), we estimated numerous measures on inequalities between five groups against four welfare indicators. Our results show that horizontal inequality matters in Vietnam, in particular for ethnicity, region, and rural/urban groups. 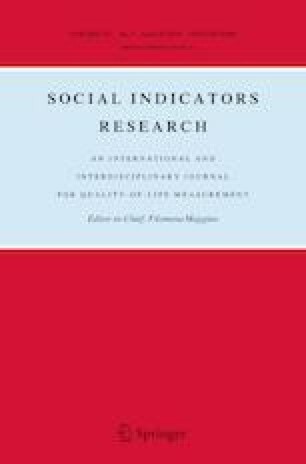 While there has been an improvement in horizontal inequality in education, this paper shows little change in other welfare indicators, in particular poverty. We also found that horizontal inequality does matter for poverty reduction in Vietnam and it needs more attention when designing poverty policies in the future. A correction to this article is available online at https://doi.org/10.1007/s11205-018-1919-y. In parallel with a rapid economic growth, Vietnam has been considered as a successful country in poverty reduction over the last decades of development. The poverty rate has been successfully reduced from about 58% in 1993 to about 15% in 2014. However, this pattern does not apply equally to all groups in society (Do 2015; Vu and Dang 2015). Some groups have been falling far behind in poverty reduction, such as ethnic-minority groups, groups of households in rural areas, or some regions and provinces of Vietnam. For example, Vu and Dang (2015) find that the headcount poverty rate of the ethnic majority group in Vietnam fell from 26% in 2002 to 9.9% in 2012, while that of ethnic-minority groups has only fallen from 74 to 59%. This trend is more or less the same based on various welfare indicators. On the one hand, this contributes to the trend of increasing inequality in Vietnam. The Gini coefficient increased from 0.35 in 1994 to 0.42 in 2012. On the other hand, this creates social division in the society and threatens social stability (UNICEF and FHI 360 2015). This context has stimulated a number of studies on inequality and social division in Vietnam, such as Glewwe et al. (2002), Lee (2008), Rodger and Menon (2010), and Nguyen (2012). The studies show that group inequality exists in Vietnam in various forms and persists across several indicators. Nguyen and Luu (2015), Doan et al. (2015), Luong (2015), Lee (2008), Rodger and Menon (2010), Nguyen (2012), and Glewwe et al. (2002) show a significant gap in income/wages, education, and healthcare between several groups, such as between rural and urban groups, regions, and genders in Vietnam. In particular, some studies (Dang 2012; Singhal 2015; Van de Walle and Gunewardena 2001) found a welfare gap between ethnic groups. However, no study identifies which type of group-based inequality is more serious in Vietnam and how does it matter for a poverty reduction. Answers to these questions will be useful in designing the poverty reduction policies. Almost all of these studies use simple proportional methods to examine group inequality. None of them provide the aggregate measure of horizontal inequality (HI), except the study by Vu et al. (2012). However, the Vu et al. study investigates the horizontal inequality in utilization of public health care services of only one type of group (households in slum vs. non-slum areas). The study also does not use the national representative data, but only the limited data from its own survey. As a result, the current literature on Vietnam limits the comparisons on the group-based inequality across the groups, variables and across nations. This paper, therefore, will fill this gap and add to the literature in two aspects: First, the paper is a first attempt to calculate the commonly used aggregate HI measures for Vietnam—group-weighted coefficient of variation (GCOV), group-weighted Gini coefficient (GGini), and group-weighted Theil (GTheil)—along with measures of cross-cuttingness (CC) and cross-fractionalization (CF). It considers four aspects (education, health insurance, durable assets and income) and five types of groups (ethnicity, religion, gender, region and rural/urban) during the period of 1989–2012. This enables a thorough examination on the issues of HI in Vietnam over time and enables a comparison in a magnitude of horizontal inequality across groups, aspects and countries. Second, the paper applies the logistic regression model on poverty determinants combined with the results of HI to study the relationship between HI and poverty in Vietnam. In general, it is argued that changes in inequality can have a significant impact on poverty reduction (Naschold 2002; François Bourguignon 2004). Inequality can have a direct effect on poverty, but more importantly an indirect effect through their link with economic growth. HI may create discrimination between different groups in accessing the opportunities to escape poverty. Birdsall et al. (1996) illustrated that highly skewed distribution of human capital is a major constraint to reducing poverty in Latin America and sub-Saharan Africa. This will provide insights on how HI may affect poverty reduction in Vietnam and will be helpful in designing poverty reduction policies. The rest of the paper is organized as follows. Section 2 briefly discusses the data used for calculations. Section 3 discusses group diversity in Vietnam, and shows the results of fractionalization and polarization indices of ethnic and religious groups in Vietnam. Section 4 shows and discusses the results on various indicators of HI in Vietnam, including education, health insurance, asset ownership, poverty, household consumption. Section 5 examines the relationship between HI and poverty. The paper concludes with Sect. 6, exploring several key factors that may underlie the trends and patterns thus mapped. This paper uses the results of two sets of surveys, the Vietnam Population Census (VPC) and the Vietnam Household Living Standard Survey (VHLSS), which are the two most relevant national representative datasets when examining the issues of HI in Vietnam. The VPC has been conducted every 10 years and the VHLSS every 2 years. Four rounds of the VPC1 have been conducted, in 1979, 1989, 1999, and 2009. However, only the results of the most recent three rounds are accessible. Information collected in the census was very basic, covering gender, ethnic group, religion, location (rural/urban; there are eight economic regions in Vietnam), education (by grades and a more detailed six-point educational scale), accommodation (living areas in the VPC 2009), employment, fertility (women), and death. The information on employment in the three most recent rounds was obtained from the representative survey part, whose sample was 5, 3, and 15% of the population of the census rounds in 1989, 1999, and 2009, respectively. The data from the VHLSS are used for poverty measurement, welfare, and distribution analysis in Vietnam. These consist of series of national representative surveys, which have been carried out since 1992. The second one was in 1998, and it has been carried out every 2 years since 2002. This type of survey has two modules; the VHLSS-expenditure module (the smaller one) is used for poverty measurement by the Vietnam General Statistics Office (VGSO) and the VHLSS-income module (with a bigger sample) is used for income measurement, although the former also includes the question on income. The data from the VHLSS are very useful for measuring household income and wealth. In addition to the variable on expenditure/consumption (usually used for poverty measurement), the data include other information such as household members’ characteristics (age, education, gender), labour and other income, asset ownership, and health. By combining two sources of survey data, the paper is able to examine the issues for a longer period of time, during 1989–2012 and cover various welfare aspects. This paper examines the HI on four welfare indicators [education, health insurance and durable assets, income (poverty status and household consumption)]. Education is measured by years of education for the population older than 15 years.2 Health insurance is measured by percentage of people in the groups having health insurance. Durable assets are measured by the values of durable assets owned by the households. Poverty is measured by the household headcount poverty rate using national poverty lines.3 Consumption is measured by annual household consumption per capita. These four welfare indicators are selected based on their representation on the welfare of people and availability of the data. Of which, poverty, consumption and durable assets are proxies for the well-being of the people while education and health care insurance are considered to be a means to improve the afore mentioned. Although health insurance is only a part of the health care aspect but it’s available in the data set. The paper also examines five types of groups (ethnicity, religious, gender, region, urban/rural) based on their significances in the welfare discrimination as identified in the current literature as well as availability of the data. The five groups can be applied only to education aspect due to data constraint. The VPC recorded the information on ethnicity at the individual level, but the VHLSS data recorded only ethnicity of the household head. Therefore, the calculations/estimations using VHLSS data at the individual level make an assumption that all family members have the same ethnicity as the household head. This does not affect the analysis because the share of ethnic minorities in two sets of data show a similar result in the Table 1 below. The data in Table 2 show that ethnic minorities are highly concentrated in a few regions. In 2009, ethnic minorities accounted for more than 79% of the population in three provinces in the north-west region and more than 37% in the north-east and central highland. Ethnic minorities account for a very low share of the population in the remaining regions. The results of calculating the fractionalization index for ethnicity and religion in Vietnam over the period 1989–2012 using both datasets are shown in Table 3. The table indicates that Vietnam is a fairly homogeneous society in terms of the population share of ethnicity and religion. The data show a trend of slightly increasing fractionalization over time using VPC data. It is notable that the fractionalization index using VHLSS data tends to be higher than that using VPC data, and the trend is different over time. However, in terms of absolute numbers, the values are not much different, around 0.24–0.29. This level of fractionalization index is much lower than the international average of about 0.44 (Gisselquist and McDoom 2015). It is also noted that the fractionalization values are slightly higher when the ethnicity data are more disaggregated. For example, the value of fractionalization for two ethnic groups (Kinh and ethnic minorities) was 0.23, while it was 0.246 when the share of 46 ethnic groups was taken into account. Table 4 shows the results of the polarization index for the two types of groups over the period 1989–2012 using different datasets. It shows a similar pattern as the fractionalization index. Table 5 shows a high value of cross-cuttingness between ethnicity and religion, and between ethnicity and region. It implies that ethnic groups are quite regionally concentrated and tends to share the same religion. Table 6 presents the results on three HI indicators—GCOV, GGini, and GTheil—of five groups in the population greater than 15 years old during 1989–2012 using two different sources of data. The results show that GCOV of ethnicity in education was in the range 0.11–0.15 recently. This is a similar range to some other countries in the region [Indonesia was around 0.10 and the Philippines was 0.14–0.15 (Gisselquist and McDoom 2015)]. The value for GGini of ethnic groups increased from 0.028 in 1989 to 0.039 in 2009 and then about 0.05 in 2012. This number is a bit lower than the education GGini average level of other countries, which are around 0.076 (mean education GGini value of 95 countries) (UNICEF and FHI 360 2015). This is partly a result of Vietnamese government’s efforts in education. Vietnam had achieved a target of universal primary education in 2010, 5 year earlier than the millennium development goal (MDG) (SRV 2015). The net enrolment rate in primary education reached 98.3% in 2012–2013 while the literacy rate of population older than 15 reached 94.7% in 2012. The gap in literacy rate among ethnic groups tended to be narrowing overtime. Beside the educational divide among ethnic groups, the results show that regional and rural/urban divides in education are also notable in Vietnam. The GCOVs of regions and rural/urban in education was 0.15 and 0.12 in 2012, respectively. More importantly, these indicators tend to slightly increase over time for regions, from about 0.12 in 1989 to about 0.15 in 2012, and tend to be maintained over time for rural/urban, at about 0.12 during 1989–2012. These urban/rural and regional divides in education do not necessarily reflect the ethnic divide as mentioned above. This is due to the fact that the GCOV of region and urban/rural in education in 2012 was still at the same level, about 0.16 and 0.11, when three high-density ethnic-minority regions (north-east, north-west, and central highland, as shown in Table 2) were taken out of the sample. Table 6 also shows that education inequality matters less for religion and gender groups than ethnicity, region, and rural/urban groups, as mentioned above. The GCOV in education by gender has been reduced from 0.072 to about 0.053 during 1989–2012. The GCOV of religion group shared a similar trend. Table 6 demonstrates a similar trend in three HI indicators-GCOV, GGini, and GTheil-for all five groups over time. The results show that there are differences in the values of HI indicators for education when using different data sources, but the trend and relative magnitude of HI indicators among different groups are similar. For example, the GCOV value for ethnicity in Vietnam was around 0.12–0.15 during 1999–2009 when using the VPC, while it was a bit higher, about 0.15–0.18, when using the VHLSS during 1998–2008. The survey sample of the VPC is larger than that of the VHLSS and it is designed to survey the Vietnamese population, while the VHLSS is designed to examine the living standards (income and expenditure) of households. In this sense, VPC data tend to be more reliable.6 However, the data from the VPC are less up-to-date compared to the VHLSS due to less frequent surveys. Table 7 indicates the GCOV on health insurance by ethnic and other groups. Health insurance is measured by mean percentage of people in the groups having health insurance. The results show that the value of GCOV for ethnic groups was reduced from 0.429 in 1998 to 0.332 in 2008, then was reduced further to 0.253 in 2012. These GCOV values on health insurance, on average, were higher than those for education shown in Table 6. However, the interpretation of GCOV on health insurance is very different to the GCOV on education when the simple proportion indicators of health insurance are examined. The survey data show that the share of the ethnic majority (Kinh people) having health insurance was 40.4%, while the share of ethnic minorities was 71.6% in 2008; the share was 49.3 and 80.5% in 2012, respectively. In other words, unlike GCOV on education, the high value of ethnic GCOV for health insurance did not reflect the disadvantage of ethnic minorities in health insurance access compared to the ethnic majority, but actually the opposite. This is probably the result of government policies to support health insurance for the poor, who are mainly ethnic minorities. However, given a big income gap between ethnic minorities and the majority, the government support of health insurance for the poor seem not to be enough to have a significant impact on their poverty status. This also shows that GCOV indicators should be examined together with simple proportion indicators in order to obtain the correct picture on HI. Table 7 also indicates almost no recent significant difference in health insurance between rural/urban groups. This is a result of government policies on providing free health insurance for the poor in general, the majority of which live in rural areas and for the ethnic minority in particular. The most direct policy is a program 139 established in 2002,7 issuing free health care certificates for 4.15 million poor people after 2 years of implementation (Nguyen and Bob 2007). Table 8 shows the GCOV on the poverty rate and household consumption for three types of group. Poverty is measured by the mean headcount poverty rate of groups; consumption is measured by mean annual household consumption per capita. This indicator is calculated at the household level using the VHLSS. In terms of poverty, the results show a significant high GCOV for ethnicity during 2008–2012, at 1.313 and 1.759. These values reflect a big gap in the poverty rate between ethnic groups in Vietnam. In fact, the headcount poverty rate of ethnic minorities in Vietnam was 30.07%, while the rate of the ethnic majority was as low as 3.21% in 2012, and was 36.84 and 6.18 in 2008, respectively. It is notable that the value of the GCOV on poverty of ethnic minorities increased over time, although the poverty rates of all groups fell. This seems to be in line with the widening gap between the living standards of the ethnic majority and minorities, as shown in the literature (Singhal and Beck 2015). This also shows that all the government’s efforts to help the poor in general and ethnic minorities in particular could not narrow this gap during 1998–2012.8 In particular, unlike the decreasing trend of HI in education and ethnicity during 1998–2012 shown in Table 6, HI in poverty kept rising during this period. This illustrates that in addition to the assistance for ethnic minorities in education, to narrow the welfare gap between ethnic groups the Vietnamese government needs to expend greater effort in improving the economic development of the areas in which ethnic minorities are located. The poverty gap among regions was about 0.886 in 2012, and was lower between rural and urban groups, at about 0.455. It is notable that the GCOV in poverty for regions tended to increase over time during 1998–2012, while the trend of urban and rural groups was not clear; it slightly increased during 1988–2008, then slightly decreased recently. Table 8 shows that the HI in household consumption during 1998–2012 was not as strikingly high as that in poverty. This demonstrates that the gap in living standards among ethnic groups was more severe between the lowest extreme and the one above the poverty line. In particular, the gap among ethnic groups was reduced during 1998–2008, but started rising again recently. Table 9 shows the results of three HI indicators by three types of groups on asset ownership, measured by the mean values of durable assets owned by the households in different groups. The values of GCOV on asset ownership were 0.258 for ethnic groups to the disadvantage of ethnic-minority households and 0.367 on rural/urban groups to the disadvantage of rural households. In terms of welfare aspect, durable assets represent the consumption over the longer period of time, or is proxy for the wealth. In this regards, the trend of inequality among groups on wealth shares the same pattern as that of consumption in Table 8. The hypothesis here is that individuals located in the provinces that have a bigger gap in education or asset ownership between either ethnicity or rural/urban areas will have a higher probability of being poor. Four models have the same independent variables except the variable on horizontal inequality (GCOV). Of which, the first model includes the GCOV variable on education by ethnicity, the second one includes the GCOV variable on education by urban/rural, the third one includes the GCOV variable on asset by ethnicity, the fourth one includes the GCOV variable on asset by rural/urban. The results of four models are presented in turn in four columns of the Table 10. It shows that all HI variables have positive coefficients at a statistical level less than 1%. It implies that a higher degree of HI in education and asset ownership between ethnicity and urban/rural areas the higher probability of individuals falling into poverty. This shows that the improvement in the education gap among ethnic group recently as found in the previous section was not enough for the poverty reduction for the ethnic minority. Similarly, the inequality in rural/urban areas in education as well as inequality in assets can be a factor that increase the probability of being poor. In short, this shows that HI does matter for poverty reduction in Vietnam and should be taken into account in the future poverty reduction policies. This paper uses two sets of the most relevant survey data for Vietnam to examine the issues of group-based inequality. This paper is the first attempt in the literature to calculate a group of horizontal inequality indicators (GCOV, GGini, GTheil) on four different welfare aspects for Vietnam during more than 20 year period. The results show that Vietnam’s society is quite homogeneous in terms of population share by both ethnic and religious groups, whereas the picture is very different when the HI in welfare indicators is taken into consideration. The society becomes highly divided in terms of the poverty headcount rate between ethnic groups. More importantly, the trend becomes worse over time and there has been no sign of recent improvement. Although the paper shows that the gap in education among ethnic groups has been improved, it may still be a factor that increases the probability to be poor. This may imply a quest for a better effort of the Government in closing further the education gap among ethnic groups and also that the improve in many other factors, as pointed out in other studies such as land holding and access to credit, returns on assets (Glewwe et al. 2002), and income diversification (Singhal and Beck 2015). Besides poverty, the paper shows a less divided society in terms of education, health insurance, and asset ownership. Although the gap in possession of health insurance exists, the share of ethnic minorities having health insurance was much higher than that of the ethnic majority. This is a result of government support of health insurance for the poor. However, it is not enough to close the poverty gap between ethnic minorities and the majority unless more policy efforts can be made. This paper also indicates that HI indicators should be used together with simple proportion indicators in order to get the correct picture of the nature of group-based inequality. The results show GCOV, GGini, and GTheil are consistent in showing the trend and patterns of group-based inequality. Finally, despite a recognized rapid reduction in poverty, Vietnam still faces challenges in managing poverty reduction for ethnic minorities and to some extent for rural/urban. In this sense, the issue of HI in education and asset ownership matters for poverty reduction and it should be given a due attention when designing poverty policies in the future. In fact, there were three more population surveys in Vietnam, which were in 1960 and 1973 for North Vietnam and in 1976 for South Vietnam. The calculation for a group of population older than 25 has also been conducted and available upon the request. There are three main poverty lines used in Vietnam. To be comparable with the results of other countries in the project, we used the national poverty line in this paper. This poverty line has changed over time based on the national budget capacity as well as poverty-reduction targets for Vietnam (Gabriel and Vu 2015). In reality, most Vietnamese unofficially practise some form of Buddhism. The programme of economic and social development of special difficulty communes in mountainous and ethnic minority areas issued in 1998 by Decision No. 135 (QĐ 135/1998/QĐ-TTg), usually called by the popular short name ‘programme 135’ in Vietnam. Although the errors of data of the larger sample can be influenced more by measurement errors compared to the smaller sample. Decision numbered 139/2002/QD-TTg of Prime Minister. Beside programme 135 mentioned above, Vietnam also had a national programme on poverty in general and a programme on rapid and sustainable poverty reduction for 61 poor districts, which started to be implemented in 2008 [issued by Resolution number 30A by the government (NQ 30a/2008/NQ-CP)], named programme 30a. Vietnam had 63 provinces in 2012 therefore there are 63 values of each HI indicator for 63 provinces. It is easy to run the similar models for two other HI indicators, GGini and GTheil however, as shown in previous sections, the results on GGnini and GTheil to a large extent are similar to that of GCOV therefore this applies to GCOV only. Open Access This book is licensed under the terms of the Creative Commons Attribution-NonCommercial-ShareAlike 3.0 IGO License (https://creativecommons.org/licenses/by-nc-sa/3.0/igo/), which permits any noncommercial use, sharing, adaptation, distribution, and reproduction in any medium or format, as long as you give appropriate credit to the UNU-WIDER, provide a link to the Creative Commons licence and indicate if changes were made. If you remix, transform, or build upon this book or a part thereof, you must distribute your contributions under the same licence as the original.